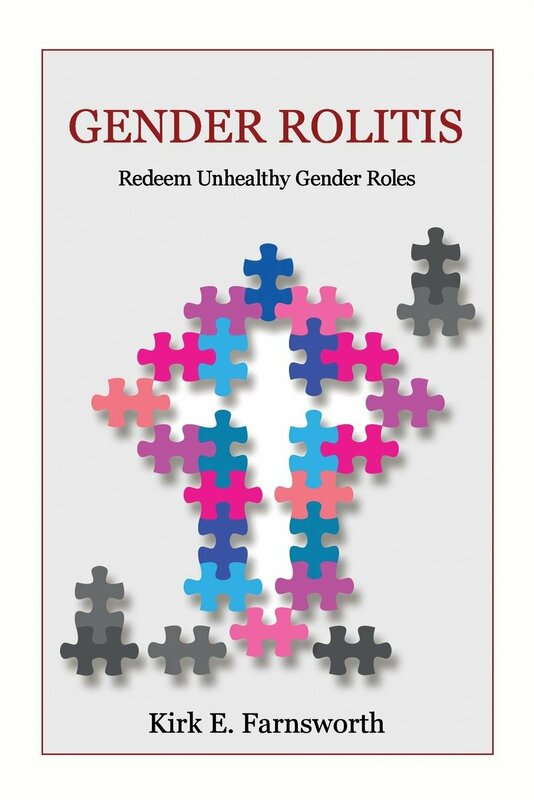 Although Farnsworth begins his book, Gender Rolitis: Redeem Unhealthy Gender Roles, with a quirky title, by the end I found myself validating his choice of the term, “Rolitis.” The gender debate in the Christian community returns again and again to our understanding of 'role' and how it is revealed in the Bible. While complementarians would have us believe that God outlines specific sets of skills with degrees of authority attached, Farnsworth provides Biblical as well as socio-psychological examples to help debunk the idea of gender roles. The opening sentence in the forward makes a solid statement of the analysis that follows throughout the book: "I have a passion for mutuality in husband-wife relationships and leadership in the family. I believe in a gifts-based partnership as opposed to a gender-based hierarchy." The introduction unpacks “Gender Rolitis”—a term coined by Farnsworth—as “an inflammatory disease of the mind that paralyzes the spiritual senses of imagination and reason and arouses an intense, feverish proclivity to biologically predetermine gender roles. It reduces personhood to codified male and female roles that severely restrict the possibilities for developing one's calling. Further, it creates a toxic culture in the family, the church, and workplace." By decisively acknowledging the problem with gender roles, Farnsworth sets the stage to reveal the ways in which gender roles have become calcified and advocated (while not being proven Biblically) by many Christian churches in the United States. One of the first things set forth in Gender Rolitis, is the importance of truth. Too often we turn to secondary writing, our own faulty reasoning, or passing along misinterpretation as truth. Throughout his writing, Farnsworth augments his statements with specific scripture as well as looking at a preponderance of scripture. As an added benefit, the reader is given a rubric through which scripture can be approached which allows for growth in all areas, not simply the gender debate. In the next chapters, “Be a Godly Man” and “Be a Godly Woman,” Farnsworth once again illuminates the limitations of wrong assumptions made when men and women are seen through the single lens of gender. In doing so, we ignore the greater message that God provides to men and women regarding His glory and our service. Farnsworth points out the ways in which God provides skills, attributes, and gifts to be used by His people for His glory. Additionally, he provides an examination of the love/authority theory of complementarianism versus the love/justice theory of egalitarianism. Farnsworth concludes with chapters that provide an individual assessment to identify spiritual gifts, passions, abilities, traits, and life experiences. Also, additional resources are referenced to help Christ-followers identify and pursue their calling. By giving a way to find out our giftedness, personality attributes, and calling, he enables individuals to achieve their aspirations to better serve God and mankind. Rather than being restricted by preconceived roles, Farnsworth encourages Christ­ followers to claim their own role in life. Whenever I run across someone who seems to interact well with his or her spouse, and they seem satisfied with how things are going, I figure it's none of my business whether their marriage is based on hierarchy or equality. The only thing that really matters is how God is blessing them. He can do that in whatever way He pleases. I respect that. Truth be told, most marriages are a hybrid mixture of models, based on what is working best for them. So what if they don't fit perfectly in practice a particular model? Are they glorifying God? While the benefits and superiority of the egalitarian model are clearly observed, Farnsworth does not mandate that all believers capitulate to this approach. Rather, he provides a clear path for all Christ-followers (men and women, married, or single) to follow God, work together according to the love-justice model, seek truth, and find the calling God has for each one. Ultimately, isn't this God's intention for his children?